Ali Carter said his battle with Crohn's disease put him at a huge disadvantage during his third-round UK Championship loss against John Higgins. Carter has suffered with the condition for years and struggled throughout the 6-2 defeat by the three-time champion at the York Barbican. Carter, 36, told BBC Sport: "I have such a handicap living with this Crohn's disease. "When you have constant abdominal pain you can't settle." Carter, who has recovered from a life-threatening cancerous tumour on his lung, scored a fluent 89 in the opening frame. But Higgins lived up to his billing as a pre-tournament favourite, barely missing a ball thereafter. He capitalised on a couple of Carter misses to pinch the next two frames and rattled off five frames in succession before closing out victory. 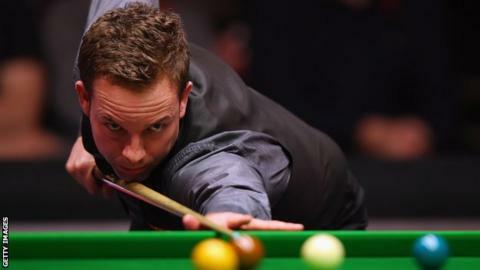 Two-time World Championship finalist and world number 28, Carter, added: "I missed a couple of balls and am 3-1 down. "It is so hard to compete at the top level anyway and when you have something like that, it makes it very difficult. "I don't want to keep going on about it and I don't feel like my game is a million miles away. But it is such a big handicap If you are not 100% right competing at this level." "It's a wonder I can compete at all. It's not an excuse, it's a handicap. But in the bigger picture, I am lucky to be alive I suppose."